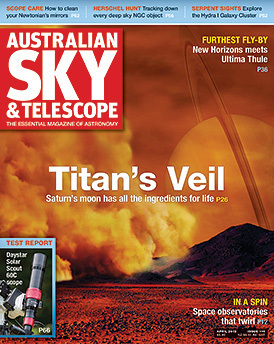 Here’s what you’ll find in the April 2019 issue of Australian Sky & Telescope magazine — on sale March 7! Titan’s veil — Saturn’s largest moon has all the chemical ingredients for life as we know it. The Ultima Thule flyby — The leader of NASA’s New Horizons mission describes its historic New Year’s Day encounter. Spinning through space — Space observatories that spin have made some of the greatest discoveries. Placing the Pleiades — Data from the Gaia mission solves a controversy about the distance to this famous star cluster. Explaining Algol — How John Goodricke and Edward Pigott discovered and interpreted a new variable star. Starfish & stragglers — Recreate Charles Messier’s historic discovery of a striking star cluster. The Herschel hunt — Are you up for the ultimate deep sky observing challenge? Binocular highlight — Spot this star cluster that’s fit for a queen. Under the stars — Sail with the Argonauts in the sky, as we explore three constellations. Planets — Watch as the Moon ‘swallows’ Saturn on April 25. Meteors — The old faithful Eta Aquariids meteor shower is back. Variable stars — Four easy and fascinating stars to find in the same field. Comets — Tales of cometary anti-tails and shadows. Deep sky — Get to know the Hydra I Galaxy Cluster. The Moon — Spot the lunar volcanic features reveal our neighbour’s ancient history. Test report — Explore the Sun with Daystar’s Solar Scout 60C hydrogen-alpha telescope. Astronomer’s workbench — Make a simple telescope out of plastic buckets! Night life — Plenty of events and activities for astronomy enthusiasts. Telescope care — In part 1 of our series on how to take care of your Newtonian, we show you how to wash and clean mirrors. Click here to subscribe to the print edition, or here to subscribe the digital edition.